Facing increasing criticism over persistently high levels of homelessness, Mayor Bill de Blasio announced Tuesday that the head of the Department of Homeless Services, Gilbert Taylor, is stepping down. CITY HALL— The Department of Homeless Services commissioner is stepping down amid increasing criticism over persistently high levels of homelessness in the city, Mayor Bill de Blasio announced Tuesday. Gilbert Taylor is the second high-ranking official in charge of dealing with city homelessness issues to resign in the past three-and-a-half months. The deputy mayor in charge of homeless services, Lilliam Barrios-Paoli, resigned in September to take an unpaid position with the agency overseeing city hospitals. De Blasio said his administration will undertake a "comprehensive operational review" of New York City’s homeless programs. "There is no city that has cracked the code on homelessness, there is no city that has solved the problem," de Blasio said during a press conference in the rotunda of City Hall. That effort, which he described as a break from an entrenched and ineffective decades-old structure, will be led by Human Resources Administration Commissioner Steven Banks and First Deputy Mayor Anthony Shorris. The review will look at how HRA and DHS work together to address the homelessness crisis. "The two agencies cover different pieces of the equation. They have to work very seamlessly together," de Blasio said. "After we tried a number of changes and reforms we didn't feel we created as much seamlessness and as much streamlining as we need. We thought it was time to step back and look at the structures that are 20 years old and ask the question whether they need bigger reforms," the mayor added. Taylor will serve in an advisory role for the department beginning in January. The mayor did not explicitly answer a question on whether he asked Taylor to leave. Instead, the mayor said it was Taylor's decision to "seek other opportunities." Given that he is at the midway point of his first term, de Blasio said the transition makes sense. "He made clear his interest in looking at other options. It connected with the fact that we had all been talking about some of the changes and reorganization we had to consider," de Blasio said. 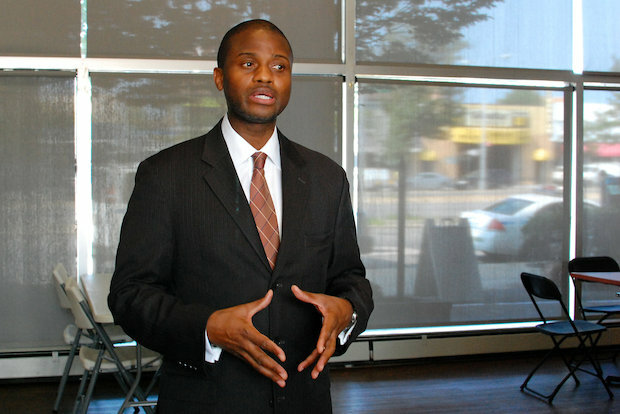 Taylor, who formerly worked under the Bloomberg administration as executive deputy commissioner for the Administration of Children's Services, received praise from homeless advocacy groups. “Gilbert Taylor began the important work of transitioning DHS away from the failed Bloomberg era policies, focusing instead on moving homeless New Yorkers into permanent housing," Mary Brosnahan, president and CEO of the Coalition for the Homeless said in a statement. Christy Parque, executive director of Homeless Services United, said Taylor reached out to homeless service providers. "He was a team player. He was accessible and we are grateful for the passion he brought to the position," said Parque. "One of his first communications was that they would use the word 'compassion' when talking about service delivery. He cared a great deal." But some providers, who asked not to be named, said Taylor may not have been the right person for the job given the rising homelessness numbers de Blasio inherited from the Bloomberg administration. They said the head of DHS needs to be much more of a strategic operator who also understands the difficult politics around the issue. "He worked his heart out on the job but frankly if you ask me: 'Did they hire the right person?' The answer is no," said one homeless services provider. "It's probably the hardest job in the city and the biggest failure of the previous mayor." It also didn't help that de Blasio has come under both media and political scrutiny for his handling of the city's homelessness problem. Under de Blasio, the homeless shelter population jumped to 59,000 in December from 53,000 at the end of former Mayor Michael Bloomberg's term. The number of 311 calls regarding homeless people jumped 60 percent since de Blasio took office. The current shelter population stands at around 58,000, including more than 23,000 children, according to the daily census. Yet the mayor denied for months that there was a problem around street homelessness. He blamed Bloomberg and Cuomo policies for the rise in the shelter population. It was only after criticism from Police Commissioner Bill Bratton that de Blasio admitted he had been too slow to acknowledge the issue of homelessness. De Blasio has also taken criticism from Gov. Andrew Cuomo, who said the mayor did not know how to manage the issue and threatened to step in. An announcement could come at Cuomo's State of the State address in January. De Blasio said this announcement had nothing to do with Cuomo's plans. "We are focused here in New York City on addressing the problem. We certainly welcome help from Albany but we are focused day to day here," said de Blasio. The mayor has introduced several new initiatives to address homelessness over the last few months, including a $2.6 billion supportive housing plan for the mentally ill and drug addicted homeless that was widely praised. The mayor has also increased funding for homelessness by $1 billion over four years and worked with faith-based groups to provide 500 additional beds. De Blasio pointed out that 22,000 people have left the shelter system since he took office and gave Taylor the credit for presiding over that effort. Evan Thies, a political consultant and president of Brooklyn Strategies, said the move represents both a much-needed policy and communications reset for the de Blasio administration around homelessness. "The homelessness problem was a lot larger than what everyone expected and what the de Blasio admin expected," said Thies. "People need to be reassured that the mayor is seriously addressing this and that this is a serious plan." At the end of his press conference, de Blasio reassured city residents that he was on top of the issue. "It's a very tough problem, it's a national problem," de Blasio said. "But what I pledge to you is we will be working on it constantly. My hands are on it every day."